The wait is over. 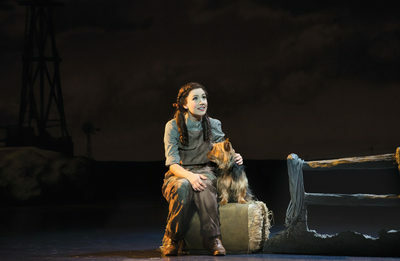 Dorothy, and her little dog too, have arrived in Melbourne to perform in the much-anticipated stage adaptation of The Wizard of Oz. Follow the Yellow Brick Road in to Melbourne's glorious heritage listed Regent Theatre, click your ruby reds three times and you'll be transported into the musical wonderland you know and love from your childhood. 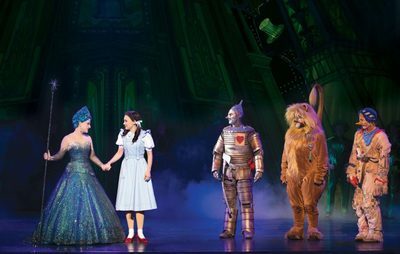 Hot on the heels of the awe-inspiring Untold story of the Witches of Oz - Wicked the Musical which left Melbourne in an green-tinged tizzy 4 years ago, The Wizard of Oz takes theatre-goers back to the enchanted world over the rainbow. This magnificent Andrew Lloyd Webber production follows the 1939 film adaptation of L. Frank Baum's book. Because of this Wizard of Oz - The Musical is every bit as magical as it was on the silver screen many moons ago. The show begins in Kansas in an almost sepia-toned set but soon rips through a tornado scene that will blow your mind. Dorothy looking out of her window and into space is an unforgettable scene. Once Dorothy's house lands on the Wicked Witch of the East in Munchkin Country the theatre springs into colourful life just as it did in classic 1930s movie. From here on in The Wizard of Oz - The Musical is a treat for the senses representing the land "where trouble melts like lemon drops" to perfection. When Dorothy meets her new friends; the endearing brainless scarecrow, the tin man without a heart and the lion with no courage, all the nostalgic buttons are well and truly pressed. The Wizard of Oz cast members are outstanding. Hats off to Eli Cooper who plays the loveably lithe Scarecrow, tumbling all over the set! Toe tapping tin-man Alex Rathgeber is a delight and John Xintavelonis' cowedly lion interpretation is a treat. Samantha Dodemaide who plays the role of the innocent sweet-natured Dorothy belts out the all-time favourite "Somewhere Over the Rainbow" more than once and does so with gusto in the second half of the show. She is a wonderful stage performer. Seeing Dodemaide perform with a real dog on stage is a lovely surprise. Two dogs in fact, on rotation. Toto is played by two furry friends whose names in 'real life' are Flick and Trouble! 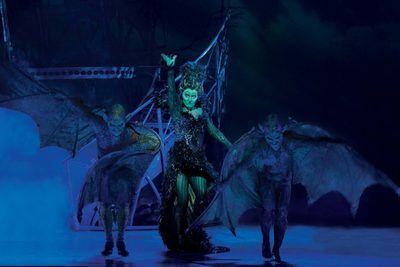 The same captivating witches previously seen in Wicked The Musical return to the stage as Jemma Rix, playing the Wicked Witch of the West, and Lucy Durack as Glinda the Good Witch. The actresses once again play their respective sorceress' roles faultlessly. The bumbling not so powerful after-all Wizard of Oz and Professor Marvel is played by Anthony Warlow. Warlow's delivery of the "pay no attention to that man behind the curtain" scene, revealing the faux larger-than-life frightening wizard is convincingly good. Again a tricky role to imitate but Warlow did well. 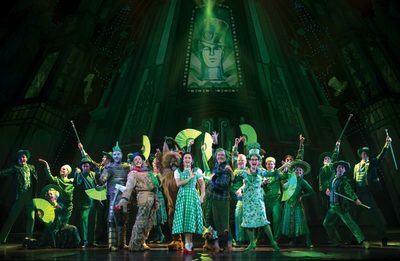 Overall, The Wizard of Oz - The Musical is a remarkable show made even better with the use of awe-inspiring video projections against epic backdrops that really do bring stage moments such as the tornado and flying monkey scenes to life. Is The Wizard of Oz - The Musical child friendly? Indeed it is although we'd probably suggest 6yrs and over, albeit due to the length of the show for fidgety bottoms rather than being dark in nature. 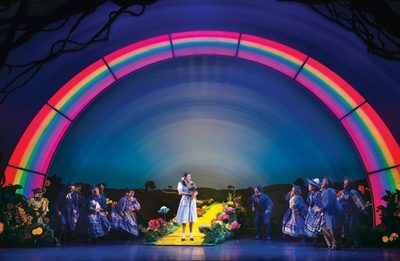 Take your own journey over the rainbow at the Regent Theatre and book tickets to The Wizard of Oz - The Musical here. Loved the wizard of oz when it was here in Brisbane!